Two journalists’ murders have shaken the EU’s claim to be a champion of democracy and the rule of law. The two murders have shattered the comforting idea that assassinations of journalists and government critics only happen in authoritarian states like Vladimir Putin’s Russia. Equally worrying is that many months later the investigations into the murders of ‘Daphne’ and of Jan Kuciak have made no progress in identifying and prosecuting those who masterminded the silencing by violence of those two watchdogs against corruption and abuse of power. 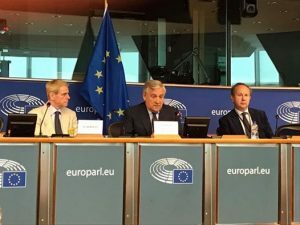 The emergence of a ‘climate of impunity’ came under scrutiny at a recent press seminar organised by the Association of European Journalists at the European Parliament in Brussels. Maltese opposition MEP David Casa declared that the investigation into Daphne Caruana Galizia’s death had been ‘completely inadequate’. The biggest threat to press freedom, he said, was when ‘criminals’ remained in power despite the exposure by journalists of systyematic corruption, people at the highest level of government acted only to protect themselves, and those who act as sources of information about the rotten state of affairs were ‘vilified, not protected’ by the state authorities. Earlier the European Parliament voted to investigate the rule of law in Malta and found ‘systematic deficiencies’ there. It also called for the removal from office of Maltese politicians who have been implicated in corruption and money-laundering linked to the Panama Papers revelations made by Daphne herself. Three men have been charged over the murder but none of them are believed to have known Daphne personally. ‘We need to know who was the mastermind of the assassination’, David Casa insisted. He accused the investigators of failing to take account of potentially significant information about the circumstances of the crime from himself and others. Senior officials, including a minister and prime minister Joseph Muscat’s chief of staff who were targets of the journalists’ exposés, had launched punitive libel suits against Daphne, some of which are still being pursued after her death. The Maltese government insists that it is fully committed to solving the murder. In mid-June Malta’s deputy police commissioner Silvio Valletta stepped down as lead investigator into the murder. The move came after a constitutional court ordered his removal, accepting the family’s concern about a conflict of interest because Valletta is married to a government minister who was also a target of allegations in Daphne’s writings. For too long, David Casa said, the European Commission was ‘fast asleep’ about corruption and rule of law failings in Malta. But Justice Commissioner Vera Jourova said recently that an infringement procedure could be launched if therewas found to be a ‘systemic problem with the implementation of EU law’ there. More than four months after what seems to have been the contract killings of Jan Kuciak and his fiancée in Slovakia, accusations of foot-dragging in the police investigation and government links with organised crime have raised fears that a climate of impunity may exist there. At the European Parliament meeting Slovak MEP Ivan Stefanek said Kuciak’s invetigations had exposed scandals linking the office of the country’s prime minister with the mafia as well as corruption related to payments of EU farm subsidies. The journalist had been threatened two weeks before he was killed but ‘nothing had been done’ to protect him. As in Malta, Mr Stefanek said, the public had lost trust in the integrity of state institutions including the government, police, prosecutors and judiciary. The European Parliament voted to launch its own investigation into the EU subsidies scandal in Slovakia. But there was still no sign of progress in the investigation into his death. Furous public demonstrations have forced the resignation of Slovak prime minister Robert Fico, who had earlier reviled journalists as ‘dirty anti-Slovak prostitutes’ over press reports about corruption in his administration. But Mr Stefanek says that in effect ‘the same guys are still running the country’. Can European institutions really be helpless in the face of the cold-blooded killing of journalists who expose corruption in high places and the deep flaws in systems of law-enforcement and justice in EU member states? The debate on press freedom among politicians and journalists at the European Parliament suggests that the situation is bad but not lost. The European Parliament is putting pressure on governments that seek to stifle investigative journalism, even if the Commission is seen as having failed to confront the member states concerned boldly enough until now. Meanwhile the Parliamentary Assembly of the Council of Europe has appointed Dutch MP Pieter Omtzigt to prepare a report on Daphne Caruana Galizia’s assassination and the underlying rule of law issues, to try to ensure that ‘the whole truth emerges’. And other investigative journalists have stepped in to carry on the work of both the murdered reporters. In Malta that intensive work was continued for some weeks by the so-called ‘Daphne Project’. In Slovakia the Organized Crime and Corruption Reporting Project has shared information with a circle of international journalists who are probing the circumstances of Jan Kuciak’s killing and following up the leads which he had uncovered. For years critics have loudly criticised the EU for failing to live up to its frequently repeated pledges to protect press freedom. The reality is still that the member states are unwilling to cede such authority to the Commission or any EU body. In 2016 the 47-member state Council of Europe adopted a muscular Committee of Ministers Recommendation on the Protection of Journalism and the Safety of Journalists. It set out detailed guidelines on how states should behave in order to carry out prompt, impartial and effective investigations into attacks against journalists to bring all those responsible to justice and stamp out the scourge of impunity. In other words, the remedy is already available and it already has the force of soft law. What is needed is the political will to make it happen.